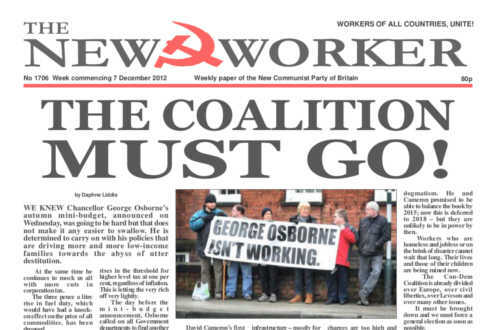 www.newworker.org | 7th December 2012 - The Coalition must go! WE KNEW Chancellor George Osborne’s autumn mini-budget, announced on Wednesday, was going to be hard but that does not make it any easier to swallow. He is determined to carry on with his policies that are driving more and more low-income families towards the abyss of utter destitution. IRAN has force-landed another American spy drone over its territory and, while experts begin to probe the machine to extract its programmes and data, the Islamic Republic is threatening to take international legal action against the United States for this blatant violation of their airspace. IT MAY have been cold and frosty outside but it was nice and warm in London’s historic Marx House as delegates and guests gathered for the 17th Congress of the New Communist Party of Britain.